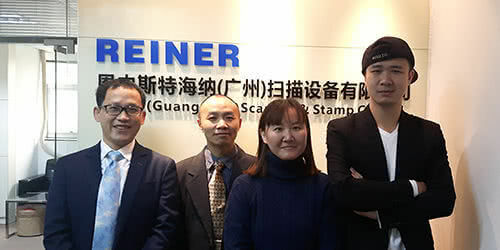 Ten years REINER integrated scanners in China! Who would have thought in 2007? We had many interested companies from China at CeBIT that year, looking at the special REINER RS8911 integrated scanners for cheque processing. The first orders came in after CeBIT. REINER has long been setting standards in the banking industry with its SB-scanners: Scanners for self-service applications, for submission of money transfers and cheques. Customers are working on paper-less processes in their companies and organisations. REINER supports this market trend with special scanners that turn cheques and similar forms into electronic data. New technologies and long know-how form the basis for new developments and ensure the company's future. Securities and other sensitive documents in particular often have many safety features. Use of special hard- and software versions in the REINER UV-scanners increases the contrast in the corresponding UV patterns. This ensures a much higher and more reliable recognition rate of the UV safety characteristics. As a medium-sized company, we were able to react flexibly to the new opportunities and challenges. In parallel to the first customer interviews on site, we drove the required founding of a REINER branch office in Guangzhou. The REINER branch office in the Eastern Tianhe District was opened in 2009, in the same building that still holds the office of REINER (Guangzhou) Scanner & Stamp Co. Ltd. The dedicated sales company was founded as a consequence of continuous acceptance and various projects with local integrators of SS-terminals throughout the country. The REINER SS scanners are used not only in the area of bank terminals. Simplified processes, validity inspections or safety characteristics are found on many documents, vouchers and value-carrying documents such as cheques. Reliability is an outstanding feature, in particular in self-service terminals that should have next to no downtimes or failures. The number of special safety characteristics has also increased continually, including magnetic scripts, water marks and other concealed markings. software settings permits reliable scanning and implementation of many different safety characteristics. Special software essentially contributes to improved image processing while ensuring high image quality among the recorded vouchers. The RS891 and RS893 self-service scanners already have a broad range of image formats available. The increased technical options usually also lead to a higher training and maintenance need. This was another reason why the first international REINER subsidiary was founded in 2015. Today, customers order their products and services right from the REINER China Team. The service team supports customers in new integrations or the corresponding technical trainings on site. Scanning – safe, diverse, reliable!